There’s a special holiday coming, but it’s not Christmas. It’s not New Years, Hanukah, Kwanza or Guru Gobind Singh’s birthday (look it up). No, it’s the Montana State Legislature. 150 of Montana’s finest minds will convene to take up the pressing issues of the day, like hunters being able to use sound suppresors while hunting lions[B1] . Or ensuring that we never get a new Bighorn Sheep herd [B2] anywhere in Montana. Apparently, FWP is running rampant with sheep lovers who want to populate the state with big curlies in a dastardly attempt to ruin the sheep industry (yeah, someone actually said that). As it stands now, there are 109 bill draft requests. You can look them all up at the Legislature’s website[B3] . There are a few bills that we like, such as Representative Pat Connell’s bill to give the FWP Commision the authority to institute barbless hook regulations and Senator Kendall Van Dyk’s Hunters for the Hungry bill. It would allow hunters and anglers to donate money as well as critters to food banks. Providing healthy, organic, protein rich food without having a food bank go broke trying to pay for the processing fee, who could hate that? Other bills that are coming forward with a lot of steam are bills that would put our state management of wolves in jeopardy by drastically altering the state management plan, place a legislative cap on the number of wolves in the state and the general whackiness that comes with every session. I’ve not seen a bill draft request to call wolves terrorists yet, but I’m sure a freshman legislator will introduce that one at some point. Bison will once again be a hot topic of conversation as will land purchases[B4] . Elk Archery bills that would eliminate the current draw system and replace it with one that gives non-resident guided hunters much more opportunity than resident archers will come back, for a fourth time. Every time, Hunters have killed the bill. Every time, the war gets more intense. Even Ranching for Wildlife, or some other Orwellian named device that hands our wildlife over to private hands to be sold like livestock will come forward this year. As one outfitter told me: “It’s going to be a bloodbath.” Folks, war has been declared once again on the average hunter and angler in Montana. And a lot of times the Legislature truly does feel like a war albeit with some very nice ties and sensible shoes. Tempers flare, nostrils too. People get hit every once in a while and some jackwagon in the back of the room thinks they’re a comedian and scoffs at others testifying, muttering under their breath like a hobo under a bridge. 12 angry guys show up strapped with Glocks and Ar-15’s and a cholesterol level high enough to kill whatever is living in the basement of the capitol (nobody knows for sure, but some speculate that it’s a Gollum like creature who lost in a landslide against a very popular two term Governor). Senate Fish and Game will once again be chaired by Senator John Brenden. Senator Brenden’s shining moment came close the end of the session in 2011 when he led the attempts to not confirm FWP Commissioner Dan Vermillion. 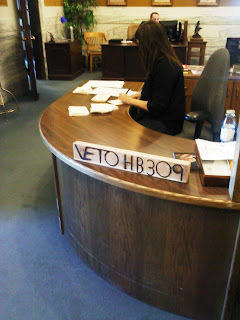 That led to a massive organizing effort by the Montana Wildlife Federation and others to turn out supporters for Commissioner Vermillion and we flooded the capitol with emails, phone calls, and I think I even saw a few carrier pigeons fly through an open window (There’s a lot of hot air in the building). House Fish, Wildlife and Parks will be chaired by Representative Jeff Wellborn. Representative Wellborn is best known as the sponsor of HB 309, the dirty ditch bill. This bill, more than any other, galvanized the sporting community and brought them to Helena for a rally that was over 400 strong. The subsequent Committee hearing, held in the Old Supreme Court Chambers, was packed both on the floor, and in the gallery. Seats had to be set up in the Rotunda just to accommodate the outpouring of Montana Hunters and Anglers who showed up and fought back. So there you have it. We’ve only brushed the surface of what’s in store for us over the next 5 months. The Bully Pulpit will be up at the Capitol, giving you all real time information on who to call, and what to call them. We must defend the legacy. Get back in fighting shape. We’re going to need every voice, every email and every warm body we can muster to fill legislators inboxes, voicemails and the halls of the Capitol itself to make sure that our heritage, our birthright, is not squandered.